If your husband of over 12 years, father of your four children, tells you he wants to marry another woman, what would you do? There's a woman presently in this situation who needs your advise...she's an avid reader of this blog, and is waiting for your comments... please tell her what to do. BTW, how many people are as shocked as I am that Madeleine McCann's mum is the prime suspect in her disappearance? Are these guys serious really? I know people do weird stuff and there have been several incidents of people killing members of their family for whatever twisted reason, but I just don't think this woman, Kate McCann, did it...why the hell is she a suspect by the way? Anyone know? Headaches: Types, Causes, Treatment and Prevention. I've been having headaches almost non-stop for the past 2 days...don't know why, so decided to find out everything I need to find about this common health issue...for those in the same category with me at the moment, here's a little tip on how to take care of your headaches. A headache (cephalgia in medical terminology) is a condition of pain in the head; sometimes neck or upper back pain may also be interpreted as a headache. It ranks amongst the most common local pain complaints. There are five types of headache: vascular, myogenic (muscle tension), cervicogenic, traction, and inflammatory. Common causes are tension, migraine, eye strain, dehydration, low blood sugar, and sinusitis. Much rarer are headaches due to life-threatening conditions such as meningitis, encephalitis, cerebral aneurysms, and brain tumors. When the headache occurs in conjunction with a head injury the cause is usually quite evident. A large percentage of headaches among females are caused by ever-fluctuating estrogen during menstrual years. This can occur prior to, during or even midcycle menstruation. Not all headaches require medical attention, and respond with simple analgesia (painkillers) such as paracetamol/acetaminophen or members of the NSAID class (such as aspirin/acetylsalicylic acid or ibuprofen). In recurrent unexplained headaches, healthcare professionals may recommend keeping a "headache diary" with entries on type of headache, associated symptoms, precipitating and aggravating factors. This may reveal specific patterns, such as an association with medication, menstruation or absenteeism or with certain foods. It was reported in March 2007 by two separate teams of researchers that stimulating the brain with implanted electrodes appears to help ease the pain of cluster headaches. Some forms of headache, such as migraine, may be amenable to preventative treatment. On the whole, long-term use of painkillers is discouraged as this may lead to "rebound headaches" on withdrawal. Caffeine, a vasoconstrictor, is sometimes prescribed or recommended as a remedy or supplement to pain killers in the case of extreme migraine. This has led to the development of paracetamol/caffeine analgesic. One popular herbal preventive treatment for migraines is Feverfew. Magnesium, Vitamin B2, and Coenzyme Q10 are "natural" supplements that have shown some efficacy for migraine prevention. Yesterday, an accident victim was brought out alive from his car...which was damaged beyond recognition...around his neck was a rosary bead! I was brought up in a strict catholic home and one of the things my mum thought all of us is the importance of the Rosary...not just praying it, but having a Rosary bead on us 24/7. It just wasn't my thing until five years ago when an aunt claimed to have survived an accident because she had a Rosary bead in her car. The following day I agreed to wear a blessed hand Rosary, two months later, five years ago, I dropped the hand Rosary and started wearing the ring Rosary, it's been with me 24/7 since then. It's on my fourth finger, right hand...and I'll wear it forever! I have one in my car and another in my office. For some reason, I feel like it protects me, there are so many evil things on the way that just never touches me, there have been close calls that were averted, bad things that were supposed to happen that didn't happen. I don't know, I just feel it's extremely important to have one of God's prayer bead on you at every point in time. If Catholic, then a Rosary or Scapula is recommended, if not Catholic, find a prayer bead your church believes in...or maybe just have a bible close to you all the time. I get the feeling this things really work. Not only do you have a guardian angel in your heart, you have it following you around to protect and giude you. If you've never carried a prayer bead around with you...try it and see the difference. Someone asked me a confusing question today. He said " You believe something to be true without any doubt in your heart, but you can't see, hear, feel or touch it...Linda, how do you prove what you can't see? Why do you believe what you can't prove? For instance, you can't proove that God exists but you believe he does. You can't personally prove that there are other planets, but you believe in Jupiter, Venus, Mars, Mercury etc, you can't prove the world is round as you don't have the ability to float above it to check, but you believe what scientists say. How can you prove that that really was the moon that Neil Armstrong landed on in 1969? There are so many things we can't prove, but we believe in them. If you can't prove something DOES exist, does that prove that it does NOT?" I couldn't give him an answer, hopefully most of y'all are brighter than I am. So the question is this: How do you proove what you can't see? Why do you believe what you can't prove? If you know the answer, please supply it. Meanwhile beautiful 41 year old actress, Halle Berry, told press today that she's expecting her first child with Canadian model boyfriend, Gabriel Aubry. 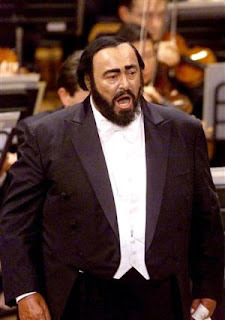 Also, Italian Opera singer, Luciano Pavarotti, 71, died today after battling pancreatic cancer for over a year. May his soul rest in peace. Soul E "Nobody can tell me how to live my life. It's true pastor Chris was not in support of this union from start, but I don't think he has the key to my life. I don't give a damn about anybody that is not in support. Anybody that does not like me and my wife should go to blazes for all I care...they should go to the Lagoon and die"
Ure "Whatever you're doing and somebody is not in support of it, you just have to avoid the person. Pastor Chris has never been in support of our this union from day one. We were not banned, we willingly left the church"
D'banj has been nominated for one Mobo award (African artiste of the year)and four Channel 0 award (Best West African artiste, Best special effects, Video of the year). If you want to vote for him...send a text to 34622 0r visit http://www.channel0.za/. Also P-square are back from their Liberia tour which saw them performing in many cities in Liberia. Female singer, Ashionye, is set to launch a fragrance line...that's so cool...like, really cool! The new line called ROMANCE, which was recently launched is strictly for women. So we can create fragrances here? Interesting! Also I heard that Tara Durotoye, of House of Tara, is also set to launch her fragance line to celebrate her 10th year anniversary in business. The fragrance, which is called BE INSPIRED by Tara, wll be on the stands very soon, right beside her range of cosmetics called 'Orekelewa'...this means beautiful right? Rumour has it that actress Victoria Inyama, who lives in the UK with her lawyer hubby is very sick, hair falling off etc and undergoing chemotherapy...na true? Salawa Abeni says she's never been married to Kolington Ayinla...only had kids for him...news to me! Pastor Chris Okotie's ex-wife of 16 years, Tina, has remarried. She married a South African in the US where she's been based since her divorce from the pastor three years ago. Y'all remember it was a childless marriage? Well Tina, who is her 40's is said not only to have gotten pregnant for her new husband but has also giving birth. Isn't God wonderful? There were rumours last week that Eedris's marriage to Yetunde has crashed...well, he gave an interview recently saying all is well in his marriage...I believe him! I heard that Grace Egbabge and her...friend, Lanre Nzeribe, are floating an NGO called 'From street to school...we'll see what it's all about! Monisola Ademuluti, Miss Earth 2006, made history some weeks back by becoming the first beauty queen in the history of Nigeria, to hand over her crown, heavily pregnant. She also made history by being the first queen to hand over her crown to her immediate younger sister who won the same pageant, Miss Earth 2007. How do you two sisters win a pageant back to back? That's weird right? Especially being heavily pregnant...in the world of beauty pageantry...that's a no no...but this is Naija...where anything can happen! Jim Iyke's foundation (for deformed children) will soon be launched in Ghana...it's slated for the end of September. They say Ara is bringing Michael Jackson to Nigeria...hmmmmm...ok! On the 9th of September 2007, Nigeria ’s premier news TV Station, Channels Television and leading marketing communications firm for young people, RedSTRAT (organizers of “The Future…” Awards) will be presenting to the nation a brand new version of the quarterly event, Rubbing Minds. In its second year now, Rubbing Minds prides itself as the only event of its kind in the country. Designed in the fine tradition of modern ‘town-hall’ meetings, it has quickly distinguished itself as the only avenue for young people from a vast cross-section to discuss issues around the social, economic and political, as well as to network and synergies. The first edition of the new Rubbing Minds will seek to counter-balance the expected frenzy that will accompany the 100 Days in Office celebrations across the country. Themed ‘First Impressions’, it will reflect what young people from across Nigeria think about the new president, the governors, and the steps they have taken in the 100 days since May 29. Expected to be as intellectually charged as always, the organizers have promised that the event will maintain its easy ambience and the delicious mix of wit, candor and irreverence that have earned the event its credibility and acceptability. " Unlike other talk sessions that only manage to draw the attention of students or youths in advocacy, Rubbing Minds has achieved A-list status with its rare ability to pull a qualitative mix - from the corporate environment, business, fashion and style, music, comedy, the academia, the media, politics and advocacy. Rubbing Minds sees the elite of young people coming together to discuss of all subjects – Nigeria . The first edition of the new Rubbing Minds will seek to counter-balance the expected frenzy that will accompany the 100 Days in Office celebrations across the country. Themed ‘First Impressions’, it will reflect what young people from across Nigeria think about the new president, the governors, and the steps they have taken in the 100 days since May 29. Expected to be as intellectually charged as always, the organizers have promised that the event will maintain its easy ambience and the delicious mix of wit, candor and irreverence that have earned the event its credibility and acceptability. The event is billed to hold at rave venue, Planet One, in Lagos , playing host to 250 selected young people, as well as three special guests to be revealed\n in a few days. Even better, this session will be broadcast live ( 4pm ) on the Channels Television network – with a scheduled repeat broadcast. This is certainly unprecedented! Explaining the new partnership with Channels Television, Williams reveals it was the CEO, Mr. John Momoh “in that unobtrusive way that is his trademark, who, having encountered Rubbing Minds, decided it was to time to put it on a bigger, more accessible platform, so that Nigerians can effectively move beyond empty clichés and begin to really integrate the voice of young people into national issues and the way our country is run. Indeed, people like Mr. Momoh, Mrs. Oby Ezekwesili, Prof. Wole Soyinka, Chief Rasheed Gbadamosi, Mr. Tayo Aderinokun and others who have encountered the work that RedSTRAT does for young people and have decided to give it their full support prove themselves as authentic inspiration for the new Nigeria we keep talking about.” With the irresistible blend of Channels Television’s professionalism and unwavering commitment to detail, combined with RedSTRAT’s savvy and popularity amongst the youth population nationally, the excitement as we all count down to the reloaded version of Rubbing Minds on the 9 of September 2007 is almost breathless! " The event is billed to hold at rave venue, Planet One, in Lagos , playing host to 250 selected young people, as well as three special guests to be revealed in a few days. Even better, this session will be broadcast live ( 4pm ) on the Channels Television network – with a scheduled repeat broadcast. This is certainly unprecedented! With the irresistible blend of Channels Television’s professionalism and unwavering commitment to detail, combined with RedSTRAT’s savvy and popularity amongst the youth population nationally, the excitement as we all count down to the reloaded version of Rubbing Minds on the 9th of September 2007 is almost breathless! Enquiries about the event can be made to redstrat@futurenigeria.com, and details can be gotten on http://www.thefuturenigeria.com/. P.S: 40 seats are left open: if you wanna attend, please send a mail to http://uk.f516.mail.yahoo.com/ym/Compose?To=chude@thefuturenigeria.com with your full name, age, and occupation. Y'all remember I told you I shot the first 2 episodes of my TV show? I need to shoot at least six more before it can start airing...money hard o! Here are some pictures from the shoot...I paid alot of money to get this thing done...it almost didnt go well...bad set especially and I forgot my lines...we managed sha...enjoy! Getting my mic fixed...he didn't touch anything...! Trying to remember my lines...presenting is not easy at all o! I really can't remember why I was laughing so hard...there was nothing funny about that day. Hopefully, when we get sponsors, we'll create the best set in the world + I'll get paid to remember my lines...wink! Will be shooting the next two episodes in 2 weeks or there about. Ok, that's all folks...oh, one more thing...y'all should help me get more traffic to my blog...imagine if all 500 hundred readers introduce one person to this blog...that's 1000 hits...that would be so great. Do it for me abeg o. Kisses and goodnight. I'm always either driving or taking cabs, but occasionally I walk...long distances. I love walking, but don't do it often because I'm almost always on high heels. Imagine walking 20 miles on heels...your heels ankle will suffer for it. So here I was, above the knee figure hugging dress, cleavage in display, long curly hair (horse hair..wink! ), 2 inches high heel, my signature walk...plus that pretty face? Please, men find that hard to resist...lol. Most times when I'm walking, I get approached by men...I don't know about other women, but within 10 seconds of sighting a guy, I know whether I want to talk to them or not. If I don't want to talk to them, I find a way to get rid of them ASAP. In the past I used to simply say "I'm not interested in talking to you", but they want to talk to you, so imagine the dilemma. Once, when I was a real biatch (I once was), I'll ask them if they think I'm in the same class with them..."Am I your mate?" I used to ask, and sometimes I won't say a word to them. They'll talk for like 20 minutes and I'll ignore them until they get tired or pissed off and leave. But some heady men don't walk away when you ignore them, instead they walk in silence with you, until when you can't take it anymore and you become very nasty. Sometimes when the silent treatment doesn't work, I flag down a taxi and leave the scene, when I can't do that, I walk into a supermarket, a restaurant etc just to get rid of them. Some men are so annoying in their manner of approach, their looks even turn you off, or maybe its the first word that come out of their mouth, sometimes it's the bad English or annoying accent...you just don't want to hear another word. Some of them have wedding rings on their fingers and they are asking for your number? Those ones I totally ignore...pure waste of time! So for several years, I kept coming up with several ways to get rid of these guys. Three years ago, I came up with "I have a boyfriend!". That didn't work. Some of these men don't care. That doesn't fizzle them. Two years ago, I came up with "I'm engaged", that worked for a while, but after sometime, these guys wizened up. They look at your finger, no ring, they either don't believe you or don't want to know...they keep bugging till you almost tear the hair from your scalp. So last year, I came up with the fastest way to get rid of unwanted attention. I started saying " I'm married". Oh that worked...thank God...immediately you say that they apologise and leave...oh it really did work...UNTIL yesterday. I told a guy yesterday "I'm married! ", he said "So?" So? Like, is this guy shitting me or what? A women tells you she's married(Whether it's true or not) and you say so? Then he says "I have married girlfriends...can I have your number? Call you sometime?" This guy is about to see another side of me...mennn!lol. I acted like a real married woman and gave him a piece of my mind...oh men..I turned on my bitchy attitude...it wasn't even funny! Anyone have any suggestions on how to get rid of these annoying guys in less than 20 seconds? Oh, by the way, the 'I have AIDS' doesn't work either...tried that once and the guy said..."oh, I'll take care of you" not even funny! Anyone feeling me on this? Similar experiences? What do you do in a situation like that? Naija news and gossip coming tomorrow. Cheers! Is it right to go through your partners private things? Like phone, documents, briefcase, wardrobe etc? Is it an invasion of privacy or do you have the right as the person's partner? This is something most of us do, especially women, but is it right?